This is a clipless holster that clings where you stick it. No Belt Clip is necessary. The non-slip holster utilizes friction to stay in place. You will not find a more comfortable holster. The Comfort Cling has a GEL-Like core that completely dissipates the sharp edges of your gun. It works as an IWB holster (inside-the-waistband). It also works great as a pocket holster. You can use it to stow your handgun in a glovebox or safe as well. The trigger will be safely covered by your Comfort Cling holster. Why is the Comfort Cling a Great Holster to Stock in Your Store? Non-Slip Layer: The exterior layer is a non-slip fabric. When you put the holster in your waistband or pocket, it will stay behind when you draw your handgun. 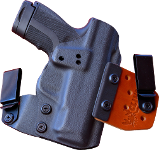 It is very durable (unlike other clip-less holsters on the market) & designed to provide years of service. Cushion Layer: We have designed a cushion material that has the feel of GEL yet weighs less than foam. You won’t feel any of the sharp edges on your handgun with this cushion barrier. Inner Layer: Ballistic nylon provides a very tough, durable interior for your handgun. It is low friction so that your handgun will slide out easily. Sometimes you don’t want to go through all the trouble of mounting an Inside the Waistband (IWB) holster. Perhaps you’re in hurry and just want to grab your gun & holster and go. This is where the Comfort Cling really shines. Putting on your gun and holster is as simple as grabbing it and sticking it inside your waistband wherever you want your pistol to be. Plus, the Comfort Cling works great in a pocket. The holster will hold your pistol upright until it’s ready to be used. Then, when you draw your weapon, the pistol draws easily while the Comfort Cling stays behind in your pocket. As you know handguns have sharp edges. The Comfort Cling’s Gel-like Cushion Core makes the gun’s sharp edges feel as round as marbles. Carrying your pistol in a Comfort Cling holster feels like your gun is riding in a pillow. Believe it or not, the other clipless holsters available can snag the rear sight of your gun! They use a lazy Straight-Stitch. It’s faster and cheaper to make a holster with a Straight-Stitch. It’s also lower quality. The Comfort Cling holster is a high quality holster that won’t snag you’re rear sight. We only use genuine Zig-Zag stitching. Most clipless holsters on the market today are not durable. They tend to tear up within a few months of heavy use. However, the Comfort Cling holster was designed to last for years. All 3 layers are made from extremely tough materials. Other clipless holsters use thin foam or other less durable materials for the external layer. However, the Comfort Cling holster has an exterior layer made from a very durable fabric that is coated with a tough anti-slip coating. The Comfort Cling holster’s middle layer will not collapse with use. The competitors’ holsters use a lower quality foam that collapses with use. Ballistic nylon is one of the toughest fabrics available. It is extensively used in the United States military for applications that demand durability. The Comfort Cling holster uses a very tough ballistic nylon on the interior of the holster. Not only does this provide a low friction surface for an easy draw, but it will endure years of heavy use.